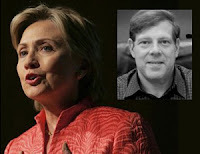 Talk about “can’t win for losing…” Mark Penn was rolling large as chief strategist for the Hillary Clinton campaign. He was one of those spokespeople made available to the media after a debate to offer “perspective.” Everyone outside the profession calls it “spin.” This was done under the handle of his personal research firm, Penn, Schoen and Berland Associates. Penn also worked on the Clinton ’96 re-election bid, and Hillary Clinton’s senate campaign. Penn’s Wikipedia entry is loaded with juicy tidbits about other work with the Bloomberg NYC mayoral run, election monitoring of Hugo Chavez election in Venezuela, work with Tony Blair, and others. This guy is busy. Penn’s other gig, as CEO of PR giant Burson-Marsteller, was to represent the South American nation Columbia in their attempt to win passage of a new free trade agreement, which Senator Clinton opposes, by the way. B-M is one of the largest communications firms on the planet. Politico.com says Sen. Clinton’s message will not change. The liberal Huffington Post says Clinton loyalists have long simmered over Penn’s strategy to sacrifice caucus states, B-M's corporate clientele, and his sometimes public arguments with other Clinton staffers. The conservative hotair.com says Penn offered research and advice, basically a “locked feedback loop” that just reinforced whatever his research revealed. · Act in the best interests of the client or employer, even subordinating the member's personal interests. · Avoid actions and circumstances that may appear to compromise good business judgment or create a conflict between personal and professional interests. · Disclose promptly any existing or potential conflict of interest to affected clients or organizations. · Encourage clients and customers to determine if a conflict exists after notifying all affected parties. It’s hard to keep all these competing interests sorted out when you’re a multi-national conglomerate. Success can be its own enemy. Perhaps you would be better served by a smaller, more dedicated firm… like Chavis Crew Communications.